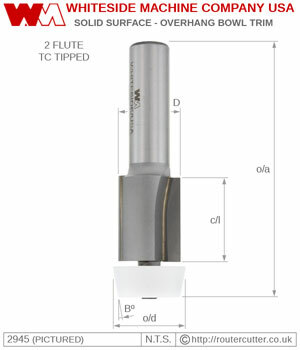 Bearing guided router bits for solid surface applications. Overhang Bowl Trim router bits for solid surface when cutting the top of the bowl on kitchen and bathroom sinks and basins. Leaves the countertop finished edge slightly overhanging the undermount sink or basin. Supplied with angled Nylon Ball Bearings. The non-mar nylon sleeve is great for bearing guided routing on dense material without leaving any scratches or rubbing. Suitable for manual feed router applications; handheld and router table work.